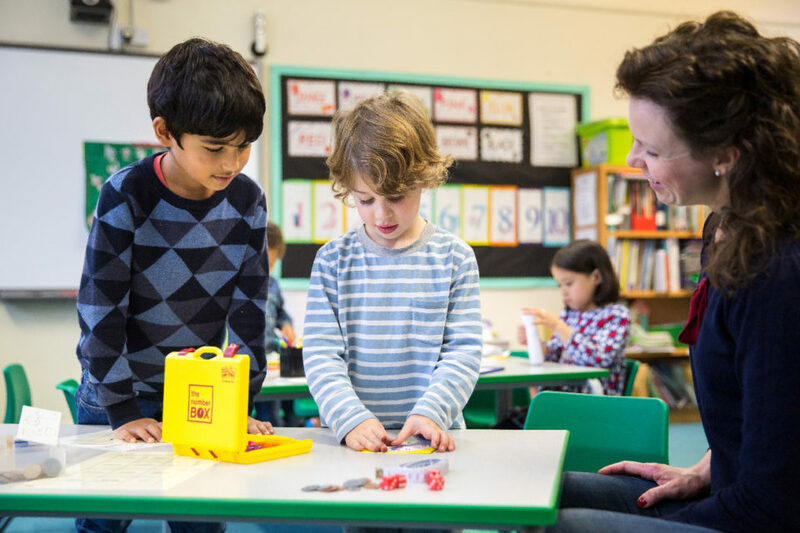 To understand number concepts, it is vital that children have no gaps in their understanding. 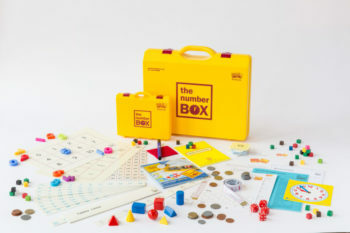 The aim of The Box is to allow children to access the daily maths lesson in class with continued support of practical resources, whilst working through their individual programme on The Box in 1:1 time, to ensure that they have a complete understanding of all the stages. 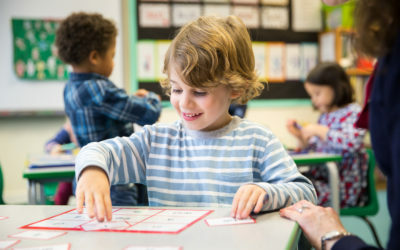 Children need to be encouraged to become independent learners, and should have an opportunity every session to use the maths vocabulary to express how much they understand and what they have learned. Children must be enabled to say what they do not understand, and ask for it to be explained or practised again. 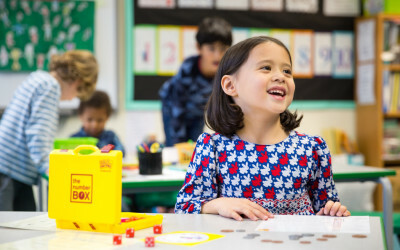 It is important that children manage the materials themselves – opening up, selecting materials, and packing the resources away after each session. This avoids ‘learned helplessness’. The Progression of skills detailed on The Record of Achievement booklets allows children to work in very small steps through a complete programme. This begins with the recognition of numbers through to knowledge of number concepts up to tens and units. It also includes small steps for teaching and consolidating concepts of time, measurement, money and shape. It has been based on the principles laid out in The National Numeracy Strategy and can be used from P levels up to level 2B. The Number Box is paper free, using instead a white board and pen, and wipeable work boards. There is no need for teacher planning, as the system is self perpetuating following the targets set out on the Record of Work books. Recording is simple – individual recording booklets are included for daily comments on successes and difficulties, and these provide a comprehensive record of progress over time. 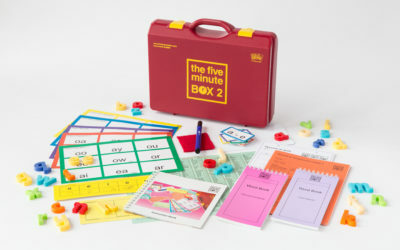 The Number Box contains sufficient resources to work with 1 or 2 children, or for support and demonstration to a small group. Additional resources can easily be purchased to allow it to be used with small groups. The Instruction Manual gives easy to follow, fully illustrated, steps enabling TAs or parents to work with a child. Instructions for number concepts need to be followed in order, while the other maths topics can be used to correspond to the current class maths topic. Each page of the Instruction Manual gives vocabulary for the TA to use with the child, and for the child to use himself as his confidence grows. Download the Number Box Leaflet (PDF 140Kb). Good self esteem is maintained as children are supported from very early stages – before they have time to fail. Children have an opportunity each session to share knowledge and progress. Children manage the resources, encouraging them to become independent. No need for lesson plans as the system is a continuous process through the skills in all areas. Once a target has been met, the child automatically moves on to the next target. No photocopiable worksheets – it is a paper free resource! No time spent in photocopying. No set up time required – just open The Number Box and go. Targets for IEPs are on every recording booklet. It provides a full record of a child’s progress over time showing areas of strength and weakness. Children who are dyscalculic, or who need longer to attain the ability to work with abstract concepts, receive continued support on a regular basis. The programme allows for progress at different rates in different areas of maths. Children who may later be diagnosed as dyslexic or dyscalculic will have had multi-sensory teaching for their difficulties from starting school. Any items lost or damaged will be replaced free of charge to ensure that The Box remains intact and useable. with individuals for 1:1 teaching on a regular basis in order to establish the basic concepts of number. It uses multi-sensory methods throughout, and provides a progression of skills and a full record of work, showing successes and areas of difficulty. 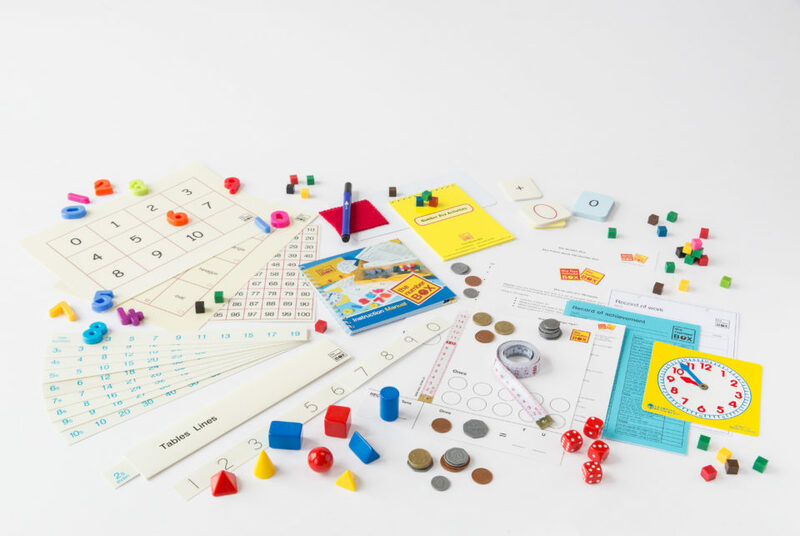 It can be used from Reception age onwards, and is equally useful as a second start programme for Junior age children who have poor understanding of number and place value. for in-class support of small groups in the daily maths lessons. It provides readily accessible tangible resources for children who are unable to work with abstract concepts. It eliminates the need to gather resources together for each lesson. Need 1:1 time – shared time, even with two children, means that one child is always less able and is still seeing themselves as less able. Regular / daily practice of known skills allows time for skills and knowledge to be transferred to long term memory. New skills are only gradually added to the known, and introduced in very small steps. The Programme Guide enables children to work from a confidence level and take small steps forward building on knowledge. All teaching and reinforcement is multi-sensory: hear, see, say and write. For some children, the difficulties are developmental and are overcome given time. Those children who need on-going help and continued access to concrete materials will benefit from having already had quality multi-sensory teaching and a structured programme on a regular basis. Individual recording booklets follow a route through the progression of skills which is vital for maths. Number Box time is intended to be part of classroom provision in Reception and Year 1, and can be carried out in either brief, planned sessions, or in ‘spare’ 5 minutes in the classroom. Children do not miss anything which may happen in the classroom as the sessions are short and are designed to be class based. 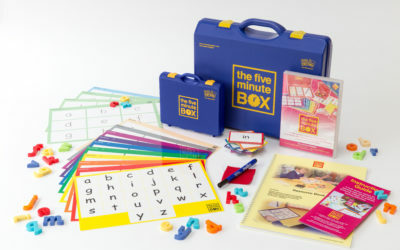 The Box can be used beyond Year 1, and has been successfully used up to Year 6 and early secondary using timetabled TA support until children are able to work with abstract concepts. Confident knowledge of these skills needs time and continued practice to become automatic. Taking ownership of the materials encourages ownership of learning and responsibility for the sharing back of understanding. Learned helplessness is ‘designed out‘ of the teaching. Sessions must be positive and supportive, seen as enabling learning. If a child does not have an instant response they must be reminded instantly – they would respond if they could! Each child is responsible for managing the materials in The Box – getting out and putting away – so that every child comes to it as a complete unit. Never assume that a child will remember something today that they seemed to know yesterday – over-learn, practise and share knowledge until it really is known. Daily re-visiting of known skills gives the child the opportunity to speed up responses and to be aware of what it feels like to really know something confidently. Notes should be kept of every session –progress needs to be shared with the child – ‘Now you know….’. Keep notes very brief – they can be written while the child is organising the next set of materials. Dated notes mean that progress over time is easy to access for report writing, review meetings, Ed Psych visits. Consistent note writing enables any other TA or teacher to pick up the booklets and work instantly with the child.